Home, inspired, saturated: This sums up my present state on the heels of a 5 day retreat to the Allegheny mountains in West Virginia, where I had the honor and privilege of receiving a scholarship award from Chronicle Books to attend the Professional Food Writers Symposium at the Greenbrier Resort. (More to come on that soon, I promise!) In the meantime, my return home immediately collided with life as I had 24 hours in which to prepare and cater a beach party for 50 wonderful guests, while catching up on family, work and soccer games. As I catch my breath and collect my thoughts, dirty laundry and mail, I turn to the only sensible remedy for restoring any semblance of order and balance: dark Swiss chocolate. You will note that there are 4 brownies on my plate. Preheat oven to 350 F. Butter a 9-inch square baking pan. Line bottom and sides with parchment paper. Butter the paper. Melt butter and chocolate in a double boiler or heatproof bowl set over a saucepan of simmering water, stirring occasionally, until smooth. Remove from heat. Whisk flour, baking powder and salt together in a medium bowl. Whisk eggs, sugar and vanilla together in a large bowl until the mixture lightens in color. Add chocolate to the eggs and stir to combine well. Add flour to the chocolate batter, stirring with a wooden spoon, until combined. Pour batter into prepared pan. Bake 25 minutes, or until top is set and sides begin to pull away from pan. Brownies will be fudgey and a wooden pick will not come out clean. Cool completely on rack. Cover and refrigerate overnight. To cut, remove brownies from pan by lifting paper at sides. Cut in small squares. (The brownies will soften at room temperature.) Keep them stored in the refrigerator, and they will last for up to one week – if they last that long. Sinfully & rich – two words that when added to chocolate, make me dream! Good for you, Lynda. Can’t wait to hear more about the symposium. 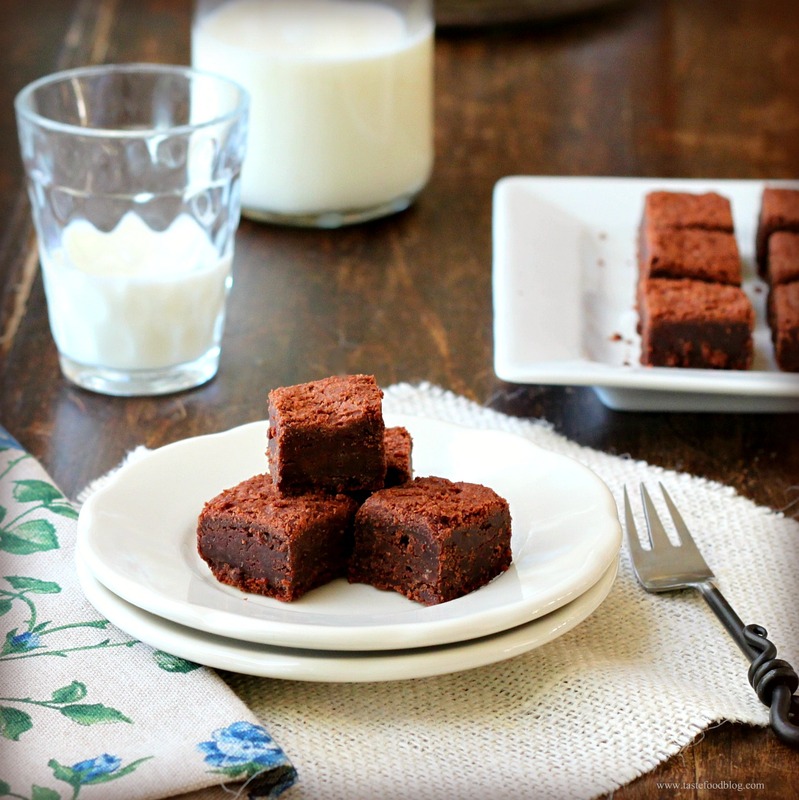 As for these brownies……I can tell from the ingredient list alone that they will be perfect! That’s such a pretty part of the country. Congrats, can’t wait to hear more. These look great. You live a busy life! And you still managed to fit in a blog post. Thank you for that. These look lovely. Can’t wait to hear about your trip. The brownies look like just the right stuff for a chocolate therapy session. You are right…those are sinfully rich and decadent! And four brownies seems like a standard serving size to me. These brownies look very tempting. I love the 70% Lindt Chocolate. I think I will make them for the weekend at the cottage. Welcome back, Lynda! I’m looking forward to hearing all about the symposium. I can only imagine it was overwhelming, amazing, inspiring and utterly exhausting. How you do it all is beyond me. These brownies are taunting me. I’m on day 19 of sugar avoidance and I’m bookmarking this page for Oct. 1. 🙂 Can’t wait for the full report from Greenbrier! Cannot wait to read more about your trip and learning experience! looks like a wonderful, dense and rich brownie! Extra points for not adding nuts ;)! These look wonderful. What is it that is so good about the simple brownie?! I am on a mission to collect as many sinfully rich brownie recipes as I can, but I’m afraid I’d have to add nuts — Mr. Rosemary wouldn’t eat them without. I think I would add nuts too. For some reason I’m one of those people that needs nuts in brownies like flowers need rain. These were great the first time around… now I’m making them again with un-salted butter for an even better finish! 🙂 Yuuuuummmmmy! Thanks! Thank you for this very easy recipe! My family loves rich chocolate brownies especially after a visit to our dentist in Houston Texas. I’m proud to say that we are all cavity free.